Last year, I shared with you the design-thinking program for first-year medical students created by Matthew Trowbridge, MD, MPH, Associate Professor of Emergency Medicine and Public Health Sciences; David Chen, MBA, Coulter Program Director, Department of Biomedical Engineering; Erik Hewlett, MD, recently retired from his role as Professor of Medicine, Infectious Diseases and International Health; and Program Manager Alex Gregor of the Department of Emergency Medicine. This academic year, the third edition of the course has been a resounding success. Design-thinking is a creative problem-solving tool, a systematic way of looking at complex challenges, a mindset that teaches how to ask the right questions to tackle the real problem. 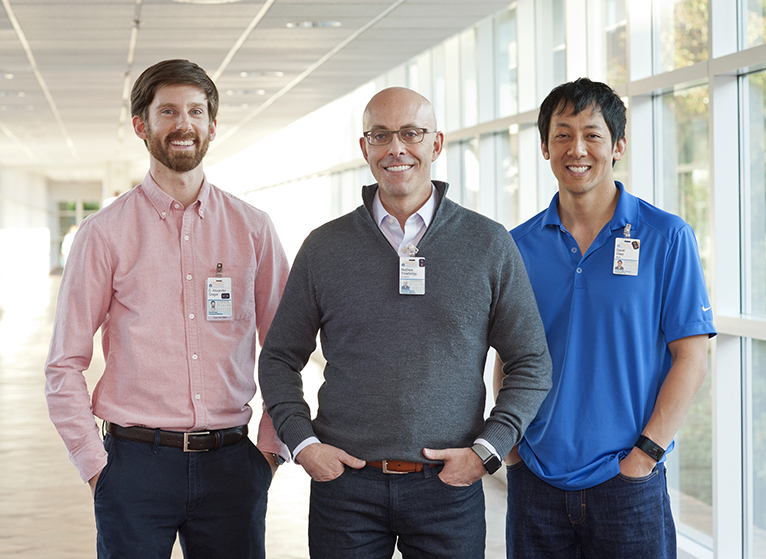 This program is teaching first-year medical students how to use design thinking to be more effective clinicians and help innovate the next era of patient-centered clinical care. A core tenet of design-thinking is serving the person for whom you’re designing. Design-thinking does this through a relentless emphasis on developing empathy for the intended user of a new product, service, or other type of innovation. The UVA Medical Design programs adapts these approaches for medical education giving the students structured instruction on interviewing and problem-solving to use as future physicians, whether it is part of their clinical care, while on research teams, or in a leadership role. For one of their recent workshops with students, Trowbridge, Chen, and Gregor wanted students to think about empathizing with patients who have different lived experiences than their own. But it had to be more than merely talking about it. How does one not only empathize deeply with a patient, but take action based on that empathy to serve the patient? They created an exercise that instructed students to walk a path from the Battle Building to the UVA Eye Clinic, and asked them to navigate as if they lost their sight. They were to experience what it was like, the pros and cons of the built environment — the sidewalks, the roads, the signage, the sounds — anything that might help or hinder the progress of a person with visual impairment. 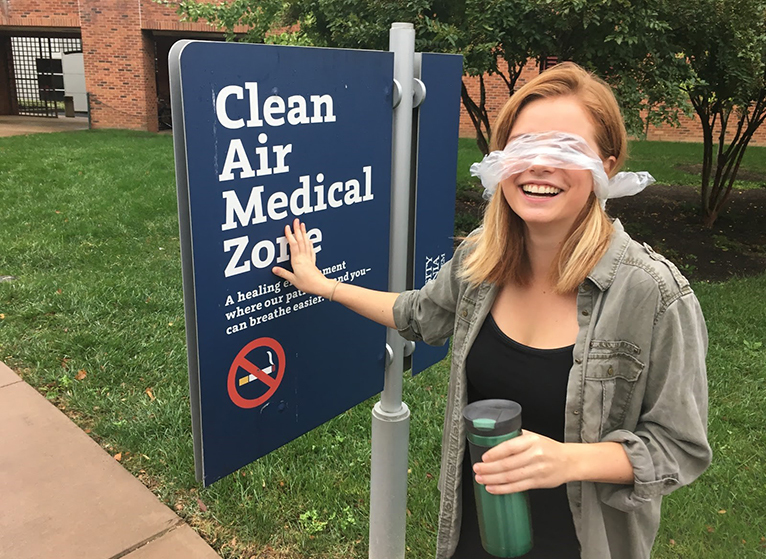 Sabrina Swoger, SMD21, and classmates navigated to UVA clinics while simulating blindness to empathize with visually impaired patients and think about how we might make our hospital — and city — more accessible for patients. Swoger, Haughey, and the other students in the course captured their findings from this fieldwork, shared that data with designers at Charlottesville-based architecture firm VMDO, and worked with the firm at its downtown studio to brainstorm potential solutions to improve the actual streetscape. It was a wonderful opportunity to show how medical professionals and designers can collaborate to help create healthier and more inclusive communities. The medical students’ proposals were varied and creative, and ultimately they were all empathetic and aimed to helping our patients in an area where medicine alone was not the answer. One example that came out of this exercise was the recommendation to install dog-bone-shaped beacons around Grounds and train seeing-eye dogs to locate these beacons. The beacon would release a treat for the dog while providing critical navigational information to the visually impaired person. Additionally, the beacon would recognize who is interacting with it and, perhaps, include personalized information about wayfinding. Some of this may be “magical thinking,” but that kind of ideation is encouraged in the early stages of the iterative design-thinking process, so long as solutions are rooted in a deep understanding of the user’s needs. As a blind person, would it be helpful not just to be able to safely cross the street, but to be told that you are, indeed, on the correct path and that your physician has been notified you’re running a few minutes late and that they are waiting for your arrival? Sounds futuristic, but most certainly a future I’d like to see come to fruition. An important element of design-thinking is for students not to constrain their initial brainstorming with the practical details of implementation — those are sorted out in later stages of the innovation process — but to think broadly about different ways to meet latent needs that are not being addressed by the status quo. One of the most powerful roles a physician has is to help patients articulate their needs and then work with professionals from diverse fields — such as other clinicians, technologists, designers, architects, engineers, scientists, and others — to create multi-talented project teams with the know-how to address patients’ needs holistically. SMD21 students Dan Lewis, Aamir Javaid, Deson Haynie, and Oom Pattarabanjird collaborate with architects Rob Winstead and Lauren Shirley of VMDO to map the physical and emotional journey of navigating to UVA while visually impaired, and to design radical new ways to improve that experience. We know that the grand challenges of healthcare are changing fundamentally and that the big problems tend to be systems problems. No single discipline can hope to tackle them alone. Design thinking helps our medical students address these challenges. 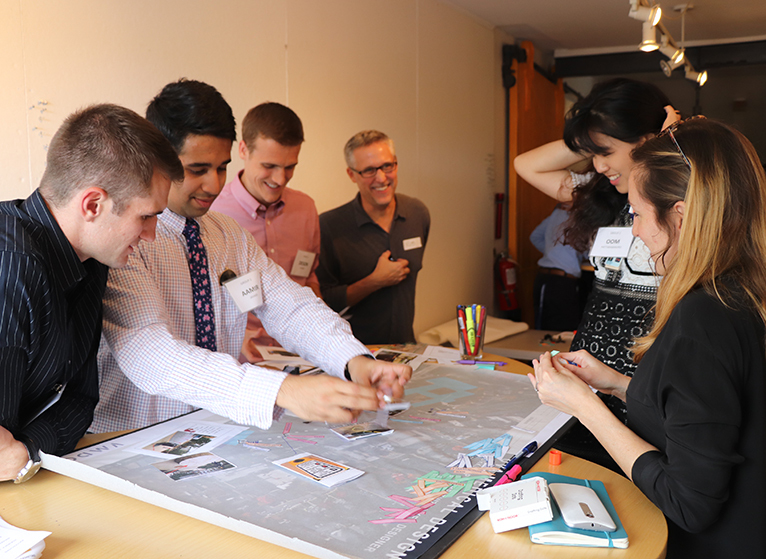 The VMDO workshop showed them how a physician can dream big and partner with other disciplines to create better built environments and healthcare systems for patients. The goal here is not to turn medical students into architects, but to be world-class collaborators with other skilled professionals. And it’s working. Previous classes have reported back that they are using their design-thinking skills in summer projects with the UVA-Guatemala Initiative, in Ghana with support from the Center for Global Health, with the Medical Student Summer Research Program at UVA, and on other projects. Students have also noted that training in design thinking has increased creativity in their process for developing basic-science hypotheses. One student combined design thinking and a maker mentality in collaboration with an orthopedic faculty member to 3D print a new type of teaching model, based on imaging of patient’s joints, for orthopedists to learn a procedure that is not frequently performed. Trowbridge, Chen, and Gregor are working on scaling up the class to provide access to more students. To that end, I am happy to share that the design-thinking program recently received a second funding award from the School of Medicine Curriculum Committee as part of its Education Fellowship program for a new initiative to develop online workshop modules that will extend access of design thinking learning opportunities, such as the one with VMDO, to a broader range of UVA students. Congratulations to Matt, David, and Alex for their hard work on bringing this cutting-edge pedagogy to our school, and to our students, who are the real drivers of its success. Thanks as well to Rob Winstead and his team of world-class architects at VMDO for partnering with UVA to offer such a great learning opportunity to our students.